Houghton Mifflin Harcourt, 2013. 245 pages. Nonfiction. Jane Austen has always been popular, but the incursion of Colin Firth in a wet shirt in the infamous 1995 BBC adaptation of Pride & Prejudice has taken Austen fandom to a whole new level. Deborah Yaffe, a dedicated Austenite since childhood, decides to delve into the fascinating world of Austen addiction, interviewing some of the most ardent devotees in the United States. 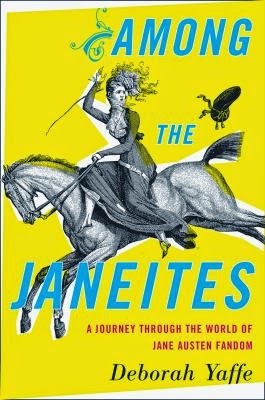 Yaffe has written an entertaining and yet thought-provoking account of what makes Janeites tick, filling the book with interviews with Austen lovers from all walks of life: academics and amateurs, costume afficionados and passionate members of "Team Darcy". She manages to tell each story with both humor and respect and even, as she finally attends the annual Jane Austen Society of North America (JASNA) conference in Regency attire, comes to understand some of the appeal of a passionate community of Austen lovers. A great read for anyone who loves Austen and wants to see how others commemorate this memorable author. The book does have some strong language.